Can We Start Using the Word ‘Died’ Again? My friend leaned across the table with heavy emotion on his face. I’ve been avoiding the writing of this post because the whole thing makes me terribly uncomfortable. I don’t want to appear critical of those who have recently lost loved ones, and so I hope you can all read this and give me your grace and kindness. I’m trying to be graceful and kind in the writing. But I also feel it’s something very important for us to think about, so I can’t avoid writing this post any longer. Here it is: recently, I’ve noticed a trend in the way that many Christians talk about someone who has died. Actually, that’s the thing I want to talk about – we rarely use the word ‘died’ or ‘dead’ anymore, as if those are words to be strictly avoided at all costs. As if there’s something disgraceful or improper or derogatory about saying that someone has died. We say they have moved on, that they’ve been healed, that they’ve said good-bye to their earthly body, and we perform all sorts of other verbal gymnastics to avoid saying what we’re actually saying. This is not a healthy trend. I wonder at this omission of the word ‘died.’ I wonder about why we don’t want to talk about death and dying? I wonder what happens when we continue to move further and further in the direction of the denial of death? We are, after all, a culture very much built on this denial. It all reminds me very much of Harry Potter and how no one wanted to say the name of their greatest enemy, Lord Voldemort. They refer to him as “He Who Must Not Be Named.” Or in Narnia (if you prefer CS Lewis’ brand of witchcraft to that of JK Rowling), the animals whisper the name of the White Witch, not wanting to speak it aloud. Of course, refusing to name something doesn’t eliminate it; in fact, in some ways, it gives it even more power, injects it with more terror, causes us to be even more afraid of it. What also happens when we try to avoid the word death is that we take away the freedom to express the heavy emotions of sadness or loss that go along with that word. When someone talks about a person who has “moved on” and intentionally avoids using the word death or died, I don’t feel free to mourn properly. I feel that they are trying to keep things positive and mourn-free, so I nod and smile, my lip trembling, instead of weeping as I would like. I’m not saying we should be happy about death. I’m not saying we shouldn’t fight to stay alive. But when someone has died, let’s use the word. 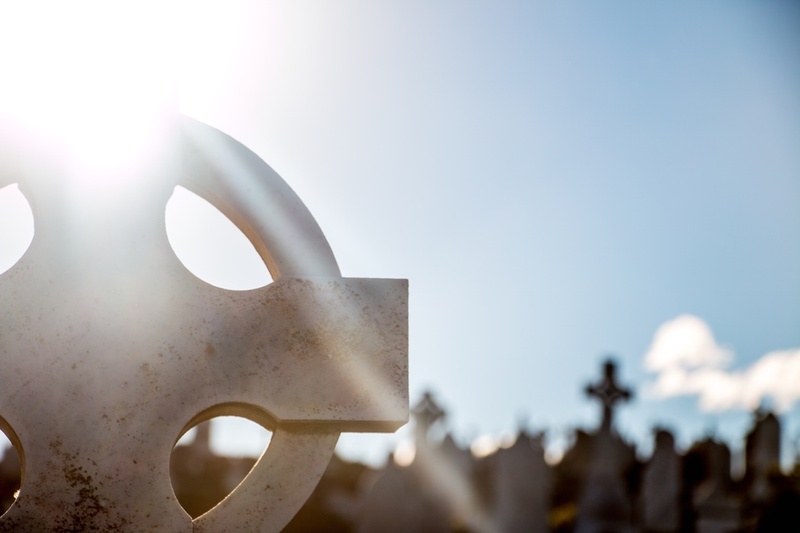 Let’s name Death so that we can put it in it’s proper place in the Christian tradition: immediately before a Resurrection. I couldn’t agree more! Thank you for having the courage to write about this! Thank you for this post. In the past 10+ years I have had to face the death of a family member too many times. Growing up on a farm we were faced with the reality of death (cats, dogs, cows, calves) at a young age. When my grandparents died we helped to shovel the dirt on top of their caskets. We faced the reality of life and death. Several years ago I became aware that no one was saying “died” but instead were saying “he/she passed”. What?? Passed what? It’s not a complete sentence. You’re right. It doesn’t give room to feel the ugliness of loss and grief. Yes! I HATE it when people say that we “lost” Elliott. Where did we lose him? He was right there – he died. To me, I felt so much MORE offense when people danced around it instead of just saying what happened. It’s not like the softer words made the pain any less. Anyway, yeah. I have big feelings about this. Also, if someone uses the word “died” or “dead,” that is almost certainly intentional. Please use the language they are using. It matters. Yes to this! As a woman who lost her father to cancer when I was 16, it has been hurtful when people won’t refer to death as death. It takes away the power of that experience from me – which was the most hurtful, life-changing event of my life. He died. He’s gone. I have nightmares still (almost 20 years later) that he’s living somewhere in South America, hiding from me. Death is the only word that is a realistic label. I am glad you did write this and I agree with you. My son in law died (I almost wrote passed away, ha!) last year and it was very sudden, a brain aneurysm at 32 years old. He was a great guy, loved by all, but what he did best was be a daddy to my granddaughter. We had several discussions about the best way to handle this and whether a five year old could comprehend the magnitude of such news. We knew she understood the concept from a recent series of conversations about death (of a fish) and how you can’t fix it. Watching my daughter tell her daughter this horrible news was one of the worst moments in my life but she was very direct and I think it was the best way, for us anyway. My granddaughter still announces that her daddy died to random people and that can be awkward. But it can also be the start of a beautiful conversation about God and heaven and love. Thanks for this Shawn. Immediately after our granddaughter died in a car accident four months ago, I was in so much shock that all I could say was “we lost her.” As a family we felt so lost without her. I couldn’t even say that aloud more than once a day because it hurt too deeply. But as time has passed, the only thing I know for sure is that she died. So that is what I say. And sometimes I even say she was killed (gasp!) in a car accident, which makes people’s eyes bug out. The hard truth is people die. It’s part of life no matter what you call it. I’m so sorry, Barbara. I certainly don’t want to be critical of using those terms in every case, and it sounds like for you they were a healthy coping mechanism as you came to terms with what had happened. Again, I’m very sorry you and your family have had to go through this.